Mark Fosdick sent in this one. 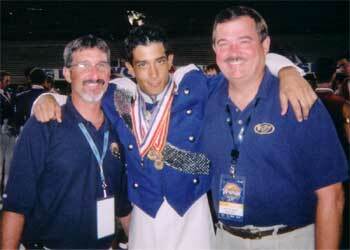 "This is a picture of me, Bluecoats director Bill Hamilton and program coordinator Larry Hershman. This was at finals retreat this year (and this was my age-out year). I joined the Bluecoats in 2000 as a contra player. "In 1999 the Bluecoats didn't make finals and a lot of people were worried about the up-and-coming year. But with the fantastic leadership of Bill and Larry and a lot of hard work by too many people to name, we made finals and have pushed the Bluecoats to where we are today. I have to thank these two guys for my four years at the Bluecoats." Thanks Mark!